Experience the reliable performance and lightweight maneuverability of the Non-Powered VX10 Workstation from Capsa Solutions. You’ll discover a versatile computing workstation with fully-configurable storage area featuring keyless access and auto-relocking for optimal security. Choose from a wide selection of accessories to further streamline clinical workflow and health IT efficiency at the point-of-care. Available Keyless Access with Auto-Relock! Flexibility to configure with storage drawers including 3” and 6” depths for supplies, treatments, and instruments. organizing supplies and the data management process at the point-of-care. drawers provides secure storage of medications and supplies. It is easy to compartmentalize small items with these innovative drawer trays that can be sub-divided to meet your specific storage needs. Offer sub-divided storage with lids and labels for 3″ drawers. push it back to its locked position. The 4-tier configurable storage area on the VX10 is defined by you. Simply design the drawer set-up that meets your storage requirements, and if the need arises, you can reconfigure the set-up quickly and easily. The VX10 Workstation offers you a choice of 3”, 6” or 9” storage drawers with either individual cam lock or keyless security systems. Depending on the hardware set-up, you can configure up to 12” of vertical drawer space as you see fit. The secure vented laptop storage tray can be located in any of the tier positions on column. Consult with your Capsa representative to custom-design the optimal storage of your VX10 Workstation. The The VX10 Workstation offers you a choice of modular divider systems to provide segregated storage for medications and supplies. Choose from the removable 3” Drawer Tray available in 3-slot or 6-slot designs, or the individual VersaBin™ trays that offer sub-divided storage and lids. 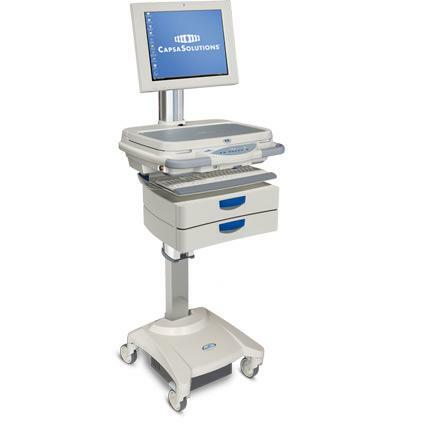 The VX10 Mobile Computing Workstation can be configured and optimized for optimal functionality for Hospitals, Long Term Care Facilities / Nursing Homes and bedside computer cart needs.